Central London is probably the most well-known and visited place in the city. Although the area is not well defined it mainly comprises locations such as Islington, Camden Town, Westminster, City of London, Southwark or Tower Hamlets. Here you will find a concentration of financial offices, public institutions and also landmarks and touristic attractions. Of course if you find yourself in Central London you should definitely visit the renowned Westminster Abbey – an impressive church built in the Gothic style and located near Westminster Palace, the traditional site for the coronation of all British monarchs. Another great site to visit is of course the London Eye, the observation wheel built in 2000 is offering the best view over the city. This of course is a must see in London as well as The Big Ben, the clock tower placed on the northern site of Westminster Palace. Of course do not forget to plan your visit at The British Museum, that holds one of the largest collections of art and artefacts in the world and we recommend that you take one full day to visit the place. Other places well known in the city are Tate Museum, The National Gallery, The Natural History Museum and of course Madame Tussauds Museum. Visiting London maybe a tiresome experience, but we guarantee that each precious minute spent here will create wonderful memories that will last for a life time. So all you have to do is find yourself a nice hotel in Central London and book your flight. 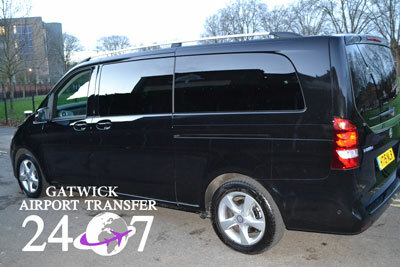 You fill find bellow the easiest ways in which you can reach Central London from Gatwick Airport. In order to get a transfer from Gatwick Airport to Central London you will need to take the Gatwick Express that departs the airport every 15 minutes. The prices start at 18 pounds and you will reach the station within 30 minutes. Depending on your final destination you will have to either take the bus or walk to your hotel. The nearest hotels at the station are: The Grosvenor, Premier Inn London Victoria or Victoria Station Hotel. In order to reach Central London from Gatwick Airport you will have a coach service available from both north and south terminals. You can choose to take a bus with EasyBus. The ride starts at 2 pounds and the bus is departing every 15 minutes, or the National Express Services and Terravision. Bear in mind that the services are not working all year long and you will have to check the schedule for your transfer. A Gatwick to Central London Transfer with 247 Airport Transfer will take approximately 1 hour and 20 minutes, with traffic included. The transfer will accommodate groups between one and eight passengers and you will have also business and VIP solutions at your disposal. The price for a Gatwick to Central London Transfer starts at 57 GBP for a standard saloon vehicle available for 4 passengers. Why should you choose a Gatwick to Central London Tramsfer? This is the most comfortable means of transportation. A professional driver will pick you up from the airport terminal with a name board and drop you off at the hotel entrance in a safe and timely manner. The prices are more than affordable and you can always access our loyalty program for additional discounts. What you have to do is to pre-book your journey and after that you can relax and have an enjoyable trip, with an extra bonus of free Wi-Fi in the car.